DWK Life Sciences, the world’s leading manufacturer and supplier of precision labware, announces Workflow Solutions, a portfolio of glass and plastic labware designed to improve productivity through every phase of product development, from research through production and commercialization. 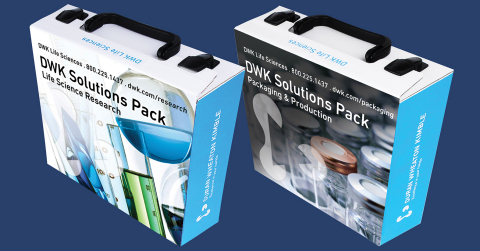 The company has created the DWK Solutions Pack, a demonstration of the different services with must-have products for research, packaging & production. Services include surface treatments, such as bar coding, serialization, cleaning, sterilization, and coating, and packaging-related services that include tare weighing, pre-sorting and just-in-time quantity shipments. Once configured, the products are RTU (ready to use) in the customer’s workflow. Customers experience immediate productivity improvements, while increasing output quality with streamlined workflows. The specialized services offered with DWK Life Sciences Workflow Solutions include: a choice of bar-coding technologies to assure accurate sample management even in severe environments; containers with tare weight values that allow researchers to determine the exact net weight of their samples; particulate cleaning performed with water meeting USP or WFI (water for injection) purification standards to comply with the USP <788> standard for particulates; depyrogenation treatment services for removing RNAse and DNAse enzymes to certified endotoxin levels of less than 0.06 EU/mL; sterilization to Sterility Assurance Level (SAL) of 10-6; silanization or siliconization surface treatments; and, customized packaging offering a range of solutions for customers. “Our consultative approach allows us to meet our customer’s operational objectives while eliminating multivendor preparation and reducing inventory management costs,” says Rick Schwartz, Senior Vice President at DWK Life Sciences. “Whether a customer produces almost any life science product, we have the experience and the products to help improve their workflow,” he added. Customers may request a demonstration of the DWK Solutions Pack for research or for packaging & production. Visit www.dwk.com/research or www.dwk.com/packaging.